Evictions from a Phnom Penh slum and a controversial World Bank project underscore the seriousness of Cambodia’s land disputes. They start with the walls, peeling off tin sheets or wooden planks from the homes that make up the lakeside slum of Boeung Kak. They carefully remove windows or old wooden doors – anything they can use to rebuild. When they’re finished, all that remains is a pile of bricks and some aging floor tiles. For weeks, Im Bunnary has looked on in fear at what has become a daily occurrence in parts of this central Phnom Penh community – neighbours tearing apart their homes. She knows that one of these days, she could be next. Bunnary is part of an estimated 4,000 families who lived around Phnom Penh’s Boeung Kak lake area. But they’ve been told they have to move to make way for the city’s largest real estate development – a sprawling, 133-hectare plan that calls for office towers and luxury villas. Critics say the controversial project is a potent example of the land crisis that plagues Cambodia today. Across the country, communities continue to face disputes over land. More often than not, critics say, it’s the rich or well connected who come out on top. 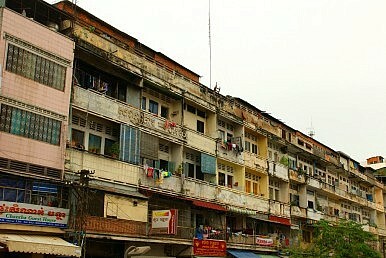 Amnesty International has estimated that 150,000 people across the country live under the risk of eviction; a local NGO, Sahmakum Teang Tnaut, has suggested that 100,000 residents in Phnom Penh alone have been evicted from desirable central districts to ones on the outskirts of the capital over the past decade. Boeung Kak will likely ensure that thousands more Cambodians are displaced. In 2007, the government awarded a 99-year lease for the land to Shukaku Inc., a company connected to a senator with the ruling Cambodian People’s Party, and reportedly backed by Chinese investors. Since then, residents have been embroiled in disputes with the developer and local authorities over claims to the land. Housing rights groups say at least 1,600 families have already moved. Now, it appears the situation may be coming toa head. In early March, authorities issued eviction letters to many of the remaining households. They’ve offered identical compensation deals to all of the families – replacement housing on the outskirts of the city, or a lump sum payment of $8,500. But many in the community say it’s not enough. The dilemma is symbolic of Cambodia’s ongoing struggle with land tenure. The Khmer Rouge abolished private ownership when they swept to power in 1975, with the ultra-Maoist regime evacuating the capital and forcing the population to work in agricultural collectives around the country. When the Khmer Rouge were toppled, those who were able to rushed back to the empty city in a scramble for any available land. People lived wherever they could find homes.